Inflammatory myofibroblastic tumour (IMT) is a rare neoplasm derived from tissue of mesenchymal origin. This tumour occurs predominantly in the lung, though extrapulmonary sites have been documented throughout the body.1 Presentation can be variable depending on location of the tumour and can include constitutional symptoms (fever, weight loss), thrombocytosis, hypergammaglobulinemia, anemia, and mass effect on local structures.2 Majority of patients with intrapulmonary IMT remain asymptomatic but can have symptoms including chest pain, dyspnoea, cough or haemoptysis.3 Most cases of IMT present in younger individuals (under age 40).4 Although the aetiology of IMT is unclear, current hypotheses suggest an inflammatory response to infection or an underlying malignancy could promote such cellular changes. Alternatively, the inflammatory component itself may be a consequence of the development of these mesenchymal tumours. We report the case of a 44-year-old woman who was found to have a suspicious lesion on chest radiography and computed tomography (CT) scan following a non-specific clinical history. The mass was subsequently resected and histologically determined to be IMT, a rare proliferation of spindle cells with polymorphic mononuclear inflammatory cell infiltration. A previously healthy 44-year-old non-smoker was referred to the rapid access lung clinic after a mass lesion was discovered incidentally on a chest radiograph. She initially had presented to her general practitioner following a 3-month history of night sweats, dry cough, vague left-sided chest discomfort, and a half-stone weight loss. The patient denied any recent travel history or sick contacts. A physical examination was normal, while laboratory investigations were significant for a microcytic, hypochromic anaemia and a thrombocytosis. Electrolytes, as well as liver function tests, were all normal. To rule out a diagnosis of tuberculosis, a chest radiograph was performed and subsequently identified a left-sided mass lesion. 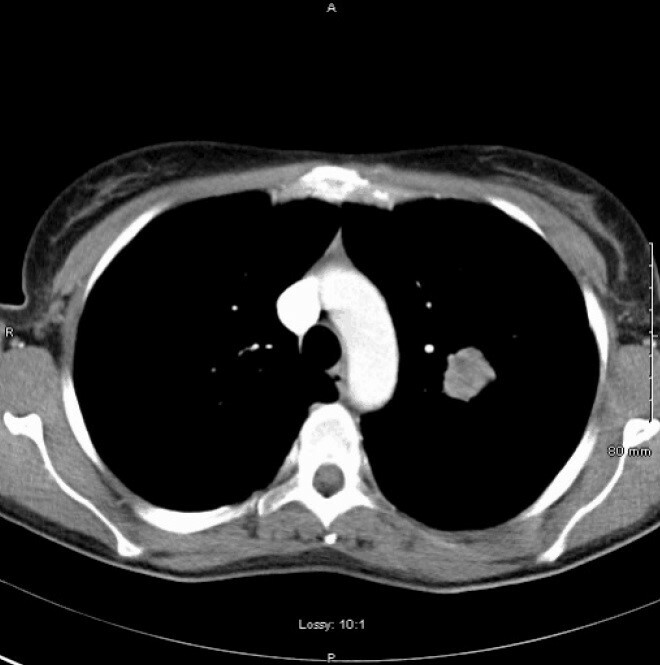 Further imaging with CT thorax showed a poorly marginated, non-calcified 2.7cm mass in the left upper lobe with no hilar or mediastinal lymphadenopathy (Figure 1). A bronchoscopy was performed, but bronchial washings, transbronchial biopsies and transbronchial needle aspiration samples were all negative for malignant cells. A subsequent positron emission tomography (PET) scan highlighted a [18F]fludeoxyglucose-avid mass consistent with a tumour in the left upper lobe. No further abnormal uptake was discovered, indicating a non-metastatic lesion. CT-guided core biopsy of the lesion revealed a spindle cell tumour with many plasma cells (Figure 2). The histopathological findings were consistent with an IMT. After much deliberation, the mass was surgically resected without any complications. At a follow-up appointment, the patient had no complaints, while laboratory investigations and pulmonary functions tests were normal. The role of radiotherapy, chemotherapy, steroids and non-steroidal anti-inflammatory drugs is uncertain but each has been employed as adjuncts in management of IMT when surgery is not a suitable option.7 Alternative treatments with crizotinib, a tyrosine kinase inhibitor, have been implemented in cases of IMT positive for anaplastic lymphoma kinase (ALK) translocations, with some success.8 Our hope is that physicians will consider IMT in their differential for all age groups, as treatment is relatively straightforward in comparison to its malignant counterparts. Proper diagnosis of patients is essential for guiding future management of this condition. 1. Patnana M, Sevrukov AB, Elsayes KM, Viswanathan C, Lubner M, Menias CO. Inflammatory pseudotumor: the great mimicker. AJR Am J Roentgenol. 2012;198(3):W217-27. 2. Coffin CM, Watterson J, Priest JR, Dehner LP. 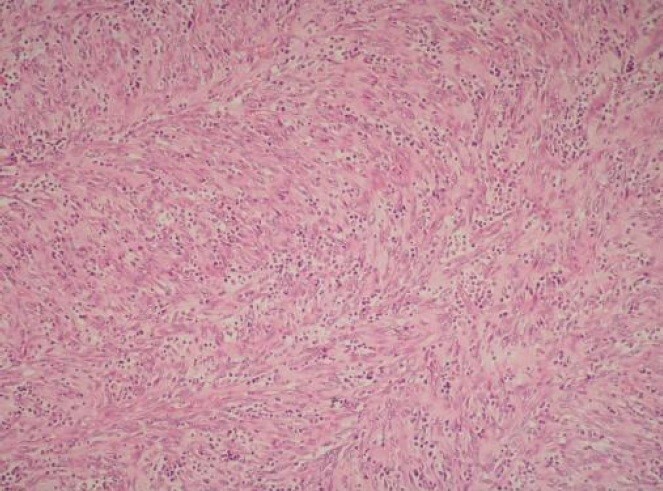 Extrapulmonary inflammatory myofibroblastic tumor (inflammatory pseudotumor). A clinicopathologic and immunohistochemical study of 84 cases. Am J Surg Pathol. 1995;19(8):859-72. 3. Sakurai H, Hasegawa T, Watanabe S, Suzuki K, Asamura H, Tsuchiya R. Inflammatory myofibroblastic tumor of the lung. Eur J Cardiothorac Surg. 2004;25(2):155-9. 4. Lai LM, McCarville MB, Kirby P, Kao SC, Moritani T, Clark E, Ishigami K, Bahrami A, Sato Y. Shedding light on inflammatory pseudotumor in children: spotlight on inflammatory myofibroblastic tumor. Pediatr Radiol. 2015;45(12):1738-52. 5. Cantera JE, Alfaro MP, Rafart DC, Zalazar R, Muruzabal MM, Barquin PG, Pérez IV. Inflammatory myofibroblastic tumours: a pictorial review. Insights Imaging. 2015;6(1):85-96. 6. Yu J, Li W, Li D, Zhang Z, Yu T. Pulmonary inflammatory myofibroblastic tumor mimics lung cancer. Thorac Cancer. 2014;5(3):271-4. 7. Tao YL, Wang ZJ, Han JG, Wei P. Inflammatory myofibroblastic tumor successfully treated with chemotherapy and nonsteroidals: a case report. World J Gastroenterol. 2012;18(47):7100-3. 8. Butrynski JE, D'Adamo DR, Hornick JL, Dal Cin P, Antonescu CR, Jhanwar SC, Ladanyi M, Capelletti M, Rodig SJ, Ramaiya N, Kwak EL, Clark JW, Wilner KD, Christensen JG, Jänne PA, Maki RG, Demetri GD, Shapiro GI. Crizotinib in ALK-rearranged inflammatory myofibroblastic tumor. N Engl J Med. 2010;363(18):1727-33.